Spearfishing is the most rewarding and sustainable way of catching seafood, but only if done safely. Our Spearfishing Advanced Safety Skills will teach you everything you need to know to stay safe in the sea, including advanced freediving techniques, CPR and first aid. The day starts with theory, looking at how to optimise breathing, the dangers of hypverventilation, recovery breathing, and breathing exercises and techniques for improving lung function. You’ll then move onto CPR practice with mannequins and learn how to use an Automatic External Defibrillator. You’ll then enter open water for the first dive session of the day, putting the breathing techniques into practice, and learning how to optimise your duck dive and finning to conserve energy and improve your weighting. Over lunch we’ll examine the risk factors in freediving and spearfishing, and how to minimise risk and maximise bottom time. The second dive session of the day will focus on self-rescue techniques and buddy rescues, including weight belt drops and towing, black-out and hypoxic fit recovery. There’ll also be a full search and rescue scenario for each participant, involving finding and recovering a casualty from between 5 and 13 metres, towing them to shore, getting them out of the water and then performing CPR on a mannequin. The Spearfishing Advanced Safety Skills course lasts a day, split between theory work in the classroom and practical work in open water. We keep course numbers low so you can learn at your own pace under the watchful eye of our skilled, experienced instructors. After the course you’ll benefit from the Go Freediving lifetime guarantee*, giving you our continued support on your spearfishing journey. 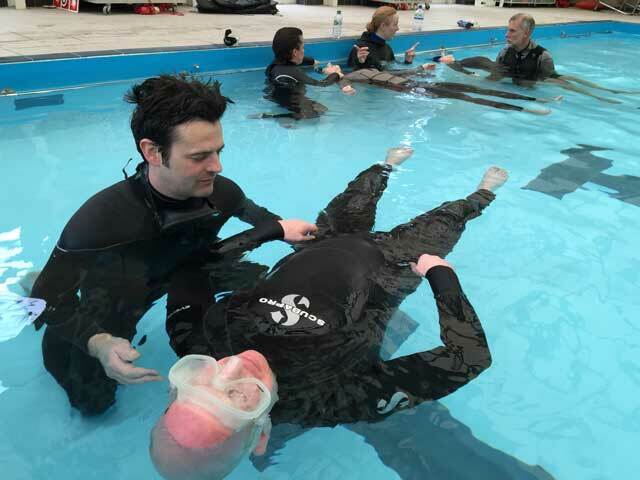 For as long as Go Freediving is trading, we will happily answer your questions and provide advice via email, telephone or in person about freediving (within the scope of your course). So if you have any queries about kit, training, where to go freediving abroad, or how to improve your technique, we’ll be there for you. You will be required to complete this self-certifying medical form before the course. If you answer ‘yes’ to any of the conditions listed you must get approval from your GP. There was such a relaxed atmosphere on the course. We discussed about other topics and this helped to get a bigger picture of the freediving world! I loved the calmness of the instructors, their good humour, laid back approach and professionalism!